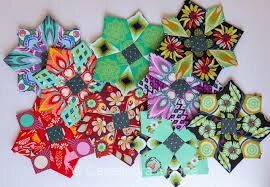 English Paper Piecing (EPP) is an addicting technique! It makes a great take-a-long project and forces you to slow down and enjoy the process. Picture represents the technique and not the actual project. Tula might be designing something new, so we're advertising the technique and not the exact project. We will confirm the actual project closer to the workshop dates.